Clarets forward Jon Walters is facing another spell on the sidelines after minor knee surgery. The 34-year-old has started only one game since his summer move from Stoke City - the Carabao Cup win at former club Blackburn Rovers, and only returned last month from a knee injury which kept him out for three months. But he has sufferered a setback with the same knee, and the Republic of Ireland international - a January loan target for Sunderland - went under the knife on Wednesday. Boss Sean Dyche explained: “He went to see a specialist with a tiny split in his cartilage. It’s not even a tear, it’s not serious, but has to be taken care of. ”They thought it best to keyhole it and deal with it. Dyche, as ever, is reluctant to set a time on his return, but he will again be unavailable for a spell. 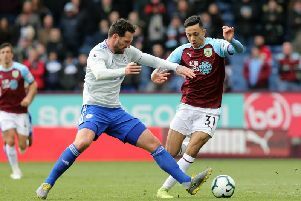 Walters’ international teammate Stephen Ward is closing in on a return after a knee problem, but won’t be available to face Manchester United on Saturday. Striker Chris Wood will also miss the game with his knee problem: “Wardy isn’t ready but he’s back on the grass training with the physio, and Woody will hopefully join him. Charlie Taylor has a slight knock to his ribs after the defeat at Crystal Palace, but Dyche is “hopeful” he will be fit, while Scott Arfield “has a chance” of returning after his hamstring problem.